With the Compact 75-watt Subwoofer Amplifier OSD-SMP60, you'll get exceptional sound no matter what you're listening to or where. This compact, tabletop 75-watt subwoofer amplifier is perfect for fitting into tight spaces. With dimensions of just 8 ½ x 6 3/16 x 2 5/8 inches, it has a discreet size and sleek shape that fits into your home's décora seamlessly. Simply connect this unit to any home recevier that has an rca output. 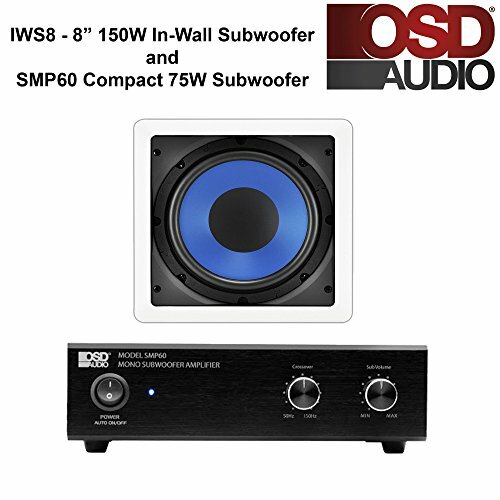 An excellent in-wall subwoofer match, the OSD-IW-S8W is an 8" passive sub with power handling up to 150 Watts. Installation is easy with our dog-ear bracket system that mounts to the sheet-rock after the cut-out hole has been made. The grille is also paintable to match your room decor and we include a cutout template that doubles as a paint shield. IWS8 150W In-Wall Subwoofer 8" - Cut-Out Dimension: 8 3/4 x 8 3/4"
If you have any questions about this product by OSD Audio, contact us by completing and submitting the form below. If you are looking for a specif part number, please include it with your message.